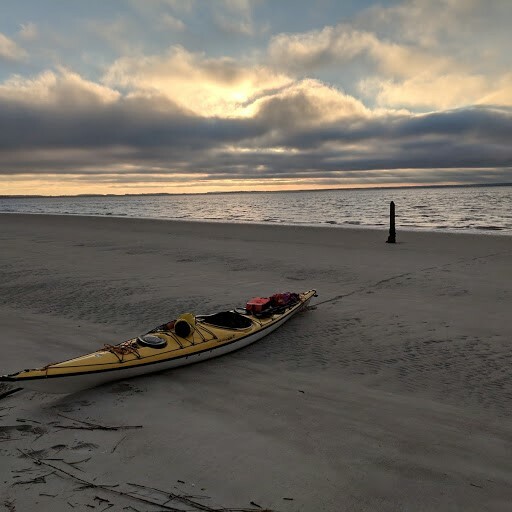 Needing some “me” time, I took off Sunday afternoon and paddled over to Little Tybee Island, where I camped, returning on Monday. The weather was marginal, as it had rained in the morning and was still gray at 3:30 PM, when I loaded my kayak and set off. 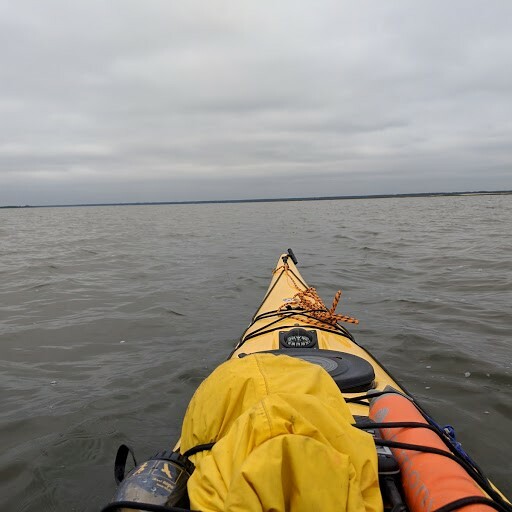 A strong wind was blowing out of the west, which with the outgoing tide, allowed me to make good time as I headed toward the mouth of the Wilmington River and then crossing Wassaw Sound, arriving on the backside of the island around 5 PM. Quickly securing my kayak well above the high water mark, I set up camp behind some dunes that provide a little protection from the strong wind. After getting camp set, I walked back out to the water’s edge to watch the sunset. I feared I’d missed it, but then was surprised when the sun dropped below the cloud bank, providing a short but incredible sunset. The tide was way out, but with the strong wind from the West, I was afraid that it might rise higher than normal, so I pulled my boat up even higher. Heading back to camp, I started to prepare dinner. Nothing fancy, just a can of beef stew and some fruit. That’s when I learned the pump of my stove wouldn’t prime and the gasket had died and cracked. I ate the stew from the can, cold, along with the fruit, downing it all with a bit of bourbon and caught up with writing in my journal. I was tired and the wind keep blowing strong, so at 7 PM, I decided to climb in my hammock and to get some sleep. I slept an hour and a half, about the length of my normal Sunday afternoon nap. At 9, I woke, thinking it must be early morning. I was wrong by several hours. Lying in the hammock, I began rereading Belden Lane’s The Solace of Fierce Landscapes. At 10 PM, I decided to try sleeping again. 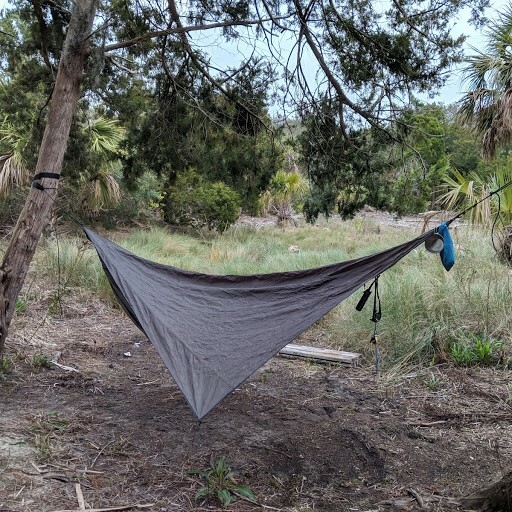 I vaguely remember waking a time or two to rearrange covers as the wind was blowing underneath the hammock’s fly and there were cold spots on my back. But I didn’t truly wake until 1:30 PM. Nature was calling and knowing that high tide was approaching, I decided to get up and check on my kayak. The clouds were gone and the sky was beautiful. It was chilly for this part of the country, temperature in the low 40s. Overhead, Orion, the great hunter of the sky followed by his faithful dog appeared as an aggressive matador chasing Taurus the Bull out of the sky. To the north, the Big Dipper was high above the horizon. “Red sky at night, sailor’s delight,” I thought recalling the sunset. Yet, the wind continued to howl. But even though it was near high tide, the water wasn’t anywhere near my boat. I went back to bed, knowing I’d have a boat for my trip back to the mainline in the morning. I woke again at 6 AM. It was still dark and the wind still blowing. I was thinking about getting up but fell back asleep. When I checked the time again, it was 7:30 and daylight. 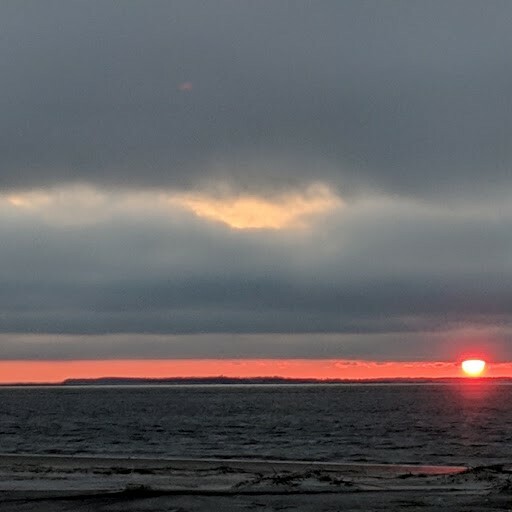 I got up to see if there would be a sunrise, hiking for a bit along the water’s edge as I made my way around the sound side of the island to the ocean side. There was no sunset. Fog and clouds had moved in and it was still windy. Heading back to my camp, I collected an armload of wood. While I could get by with a cold dinner, the lack of coffee and hot oatmeal just wouldn’t cut it. 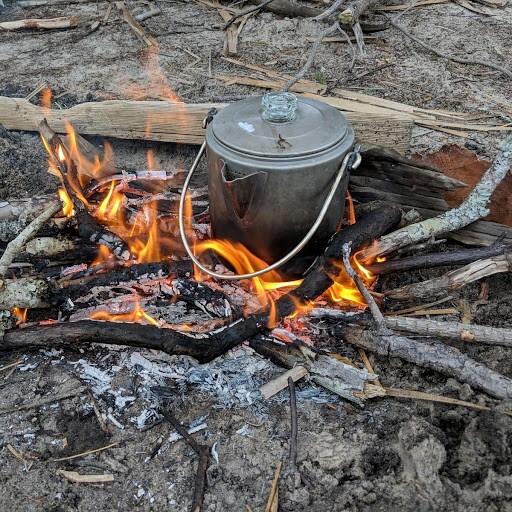 I built a small fire and in no time I water boiling for oatmeal and coffee percolating. The weather was calling for the winds to subside, so I waited around after breakfast, sipping coffee, reading, and some writing in my journal. I had thought I would have been on the way back earlier, but I wasn’t looking forward to fight the winds. Finally, about 9 AM, I extinguished the fire, packed up and a little before 10 AM, was ready to paddle. Pushing off from shore, I broke a paddle! Thankfully, I had another, so I pulled it out and continued paddling. It was hard as the wind was coming right in my face and the rising tide was flowing into the Bull River, pushing me in the wrong direction. The waves and wide was coming in at a forty-five degree angle, pushing me off course and, with the tide current, making my paddle strenuous. But I keep at it, heading to Cabbage Island. About half way across I heard a foghorn and looked out to the northeast and there was a large container ship heading toward port on the Savannah River. It appeared as a ghost through the fog, but even at this distance, I could tell it was one huge ship. 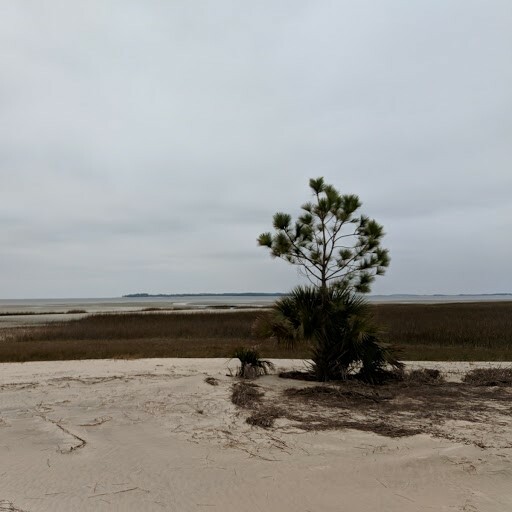 Once I crossed over to the lee side of Cabbage Island, I began to make better time even if I was paddling directly into the current, but when I turned into the Wilmington River, I had both the wind and waves directed at me. I had hoped I could make it back about as fast as I had paddled out, but it took twice as long! As I was approaching Landings Harbor Marina, the wind began to subside. You need to go on Survivor Island. I’m amazed by your survival skills. And yes, good thing you had a spare oar. Phew! Lovely pics and lovely impressions, many thoughts and many blessings, friend Jeff says this Alberta cat and her cat Theo. Beautiful photo of that sliver of a sunset! Glad you had clear skies overnight to enjoy the stars. I would hate to live somewhere that I couldn’t do that. Orion is my favorite. Always enjoy reading these posts since there is nothing similar in my neck of the woods. That sunset was really nice. Aren’t you afraid of wild animals or anything being out there alone? Wow, sounds like it was a trip full of challenges. You did see a lovely sunset though. I hope the me-time away did you some good in spite of the troubles along the way. Sounds like heavenly “me” time — except for the cold beef stew. I would have had to go hungry … or take an extra shot of bourbon! sounds likr a challenging trip! Despite the challenges, you did it! It sounds like this trip didn’t go entirely as planned. At least the sunset was nice and you got some alone time! That sunset picture is gorgeous. Camping, hiking, and paddling in heavy fog would be difficult. Wow, the sunset photograph is beautiful. 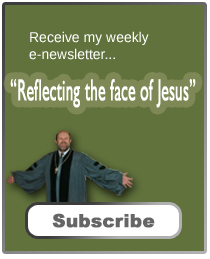 I enjoyed reading your post, a challenging trip!